The Bitter End brewery was opened in 1995 at the Bitter End pub on Kirkgate in Cockermouth, where they proudly proclaimed that it was Cumbria’s smallest brewery. The pub remains, but the brewery has now moved to an industrial unit half a mile or so away on the other side of the river Derwent. I bought three bottles of Bitter End ale from a supermarket in Windermere; Lakeland Bitter, Lakeland IPA and Lakeland Golden. The names may not seem very inspired, but I’ll come back to that. The bottles are simply but attractively labelled in a uniform format, each label proclaims Bitter End’s motto – ‘Beer without compromise’ and also with the warning ‘Not to be confused with bland, tasteless mass-produced beers’. With both statements noted, I poured my first glass. The Lakeland Bitter is mid orange in colour, more romantic observers than me would probably call it amber. At 3.8%, it’s clearly intended to be a session ale, and is very fine indeed. Exceptionally smooth, slightly nutty with hints of citrus, there is a nice bitter finish with just the tiniest hint of dry earth at the very end. All the beers tasted in this session were made with Maris Otter, Pale and Crystal malt. The bitter also has Chocolate malt, presumably to add depth of colour and a rounder flavour typical of a good bitter ale. There is just a single hop variety in this beer, First Gold, giving the whole a real taste of a high quality traditional bitter. Lakeland IPA is the strongest of the three beers tasted at 5.5%. This is a good alcohol level for a traditional IPA, many more recent versions of which have reduced the alcoholic content considerably away from the original specification of IPAs. It’s a bright, mid yellow in colour, and on the first taste provides a mouthful of hoppy flavours, Simcoe, First Gold and Cascade hops being used in the brew. The hop flavours never descend into unpleasant bitterness, however. This is an excellent IPA, and I’d be happy to drink it at any time. 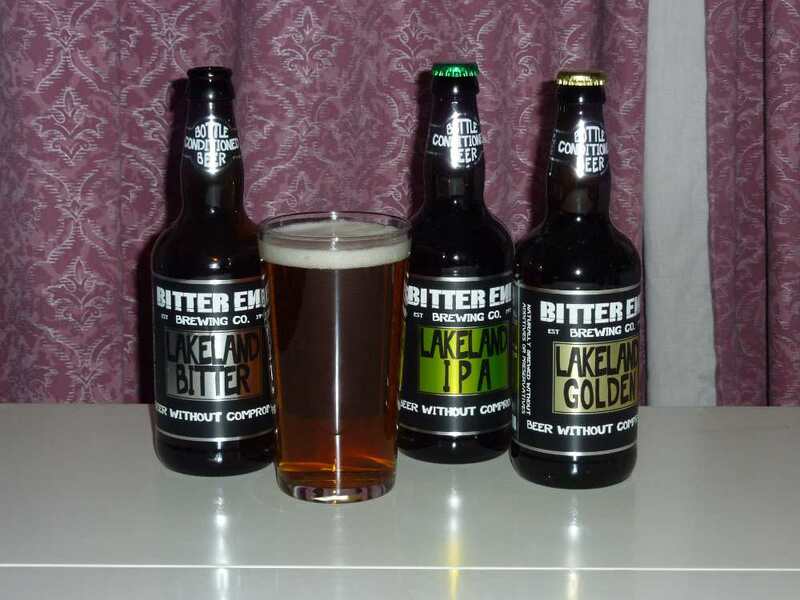 Lakeland Golden has the same three malts as the other beers tasted, but has three hop varieties – Challenger, Chinook and Cascade. This gives the beer a slightly lighter taste than the Lakeland Bitter, despite its stronger ABV of 4.3%, and a pleasing hoppy finish. Lakeland Golden is perhaps the least interesting of the three Bitter End beers tasted, but is still a rewarding and enjoyable beer. These beers were all bottle conditioned, resulting in lively, lightly sparkling ales, each with a small amount of throw in the bottom of the bottle. As I had kept the bottles carefully, and upright at all times, the sediment had settled and adhered to the bottle bottom, so there was no cloudiness in the glass. I enjoyed my foray into Bitter End beers, and whilst I was drinking, I thought about the plain but eye-catching labels and the rather dull names. It occurred to me that what Bitter End is doing is providing no-nonsense (to steal a marketing phrase from a vastly inferior product) products that ‘do exactly what they say’ on the bottle. They don’t seem to have been distracted by thinking up ludicrous names for their beer, nor by designing complicated cartoony labels. It’s not about that. It’s about the beer. 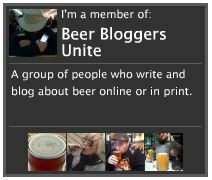 It is beer without compromise, and these beers are certainly not to be confused with bland, tasteless mass-produced beers. Bitter End – a name to watch.